I haven’t used my Cloud vape pen in some months, so I decided to drive to Santa Ana and grab some shatter to drop into it. I threw my vape pen on the charger, so it would be ready when I got home. Since Rite Greens closed its Santa Ana location, the best place in town to grab some perfect dabs is Elevated Dreams. Forget those dark budders and honeycombs you see piled on each other at other dispensaries, here you can grab perfectly purged, honey-golden glass. On top of what I feel to be some of the best quality around, Elevated Dreams also takes the time to put their concentrates on parchment paper, making sure that none of your donation is wasted stuck to the sides of plastic jars. 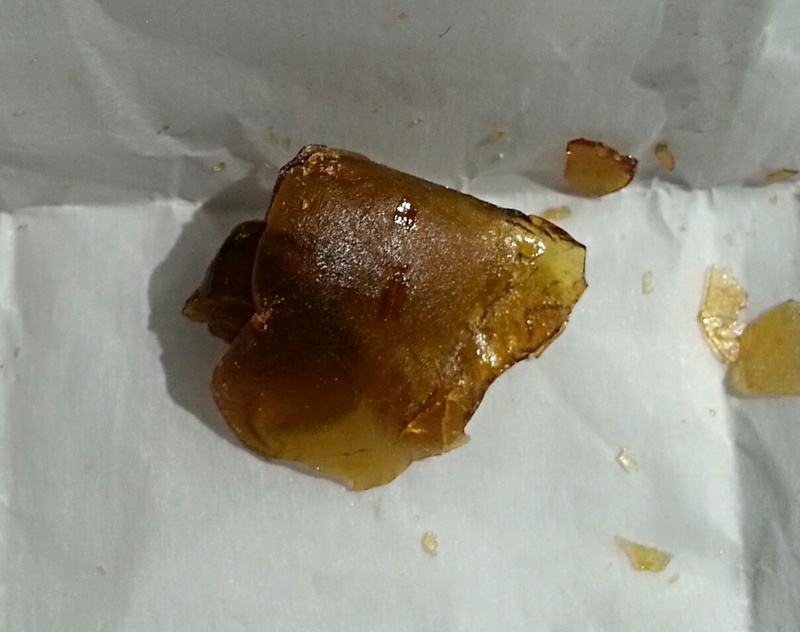 While their selection was extensive, I ended up deciding to go with some Blackberry OG by Gold Coast Extracts. This is a Los Angeles collaboration that makes some of the purest, healthiest products in Orange County’s dispensaries. Blackberry OG brings together Blackberry Kush and OG Kush. This extract is a brown tourmaline color, translucent and glowing under any form of light. Shatters like this tend not to be very fragrant, and it gives off very little scent. However, the moment I lit the coil in my vape pen, the two dominant terpenes awaken, creating a pine and dark berry aroma that will fill the room. The taste is light and the vapor thick and milky. Blackberry Kush is a great late day pain relief medication, thanks in large part to the Afghani kush I find to be so effective in other strains I’ve reviewed. It will want to distract you, and at its worst, will pull you down like quicksand into an unbreakable couchlock. These negatives just tell you that the narcotic like pain management of the kush is doing its job. The OG Kush, however, is mellow and spacy, bringing with it fantastic mood elevation. Together, these genetics make Blackberry OG an all around feel good strain. Headaches, arthritis pain, cramps, and chronic aches disappear. If you are looking for late night stress relief, it can do that too. Just beware of trying to make this a daytime medication. Although it will add to your physical well being, it will make responsibility difficult and slow your pace to a crawl. How do I get a medical marijuana recommendation? For the better part of my life, I had been obtaining my supply of marijuana, which I have long thought of as medical, on the black market, often putting myself in unnecessarily dangerous situations. However, living in a non-mmj state afforded me very few alternatives. Although self-medicating with marijuana was my preferred treatment, I was obliged to also go on a reliable prescription course of Zoloft and Xanax for my anxiety and depression and countless Aleve tablets for my arthritis. Upon arrival in Orange County, I lost both my doctor and my access to her prescription pad. With no insurance, it was only a matter of months before my refills ran out. When they did, I began in earnest researching medical marijuana recommendations and the dispensary system. The first step was to obtain my California driver’s license, not just because my birthday was coming up and it was about to expire, but because I needed it to establish residency in the state to qualify for my recommendation. Keep in mind that, although most doctors and dispensaries in the medical marijuana business will be more than happy to accept your temporary license, some have a policy requiring your photo ID. If you are declined service, know that there are plenty of options in Orange County. However, if you already have a driver’s license or state ID, then you have all you need to get your recommendation card. A quick Google search will give you several choices of doctors and offices that specialize in just medical marijuana recommendations. To simplify my choices among a number of options, I picked up an OC Weekly and tore out the first coupon I saw in the back section. I would strongly advise this approach, as the coupon saved me $35 and a ton of added research. The office I chose was 4th Street Medical, a small office in Santa Ana. I was anxious about going to get my card—mostly because I suffer from anxiety and had been off my medication for a few weeks. I was worried I would be turned down. I did not have a local doctor and my prescriptions had expired. As advised online, I brought my empty pill bottles and hoped it would be enough to convince the doctor I qualified. I had the day off and was in no rush when I went to get my rec, so I decided to forgo making an appointment and walked in just before lunch. After some preliminary paperwork, I was guided to sit in the waiting room as the doctor finished with another patient. The doctor’s office door was open during his previous appointment, which I thought was oddly undiscerning. However, the easy nature of the process was also comforting. After a short wait, I was called in and took a seat across from the doctor, an older man with an abundance of diplomas on the wall. He absentmindedly flipped through my paper work, read me a prepared information sheet discussing the dangers of smoking (he advised edibles as the healthiest method) and transporting medical marijuana, and then we had a frank discussion on how to avoid trouble with the law. All of which was helpful, but none of it was new to me as I had found it all doing research ahead of time. He then had me sign off on some more forms and handed me my recommendation, which is not actually a card but an 8×11 letter. We shot the breeze for a few moments, since he didn’t have any waiting patients, and I found him to be quite affable. He asked if I knew of a dispensary to visit, and I told him I was new to the area and completely lost in the process. He then directed me to a place across the street. Although it is technically against regulation for him to endorse a dispensary, I really couldn’t have appreciated the advice more because I was well taken care of there. Then I went to the front desk to pay, using cash, though they do accept cards for a $2 fee. In all, from car door to car door, the whole process took no longer than a half an hour, and when I walked out, I was granted permission by the state of California to obtain and medicate with marijuana. The world of marijuana strains is becoming ever more complex, as OGs are mixed with kushes, which are crossed with purples, Afghanis, and skunks. Hybrids of all types are making gains in the market, since they allow users to medicate for the widest range of symptoms. This week’s strain comes from Emerald Care in Santa Ana and is a hybrid of hybrids of hybrids, covering just about every effect marijuana offers. It would take pages to run through the long genetics of this powerful hybrid. What we are primarily looking at is a mix of two very popular strains: Skywalker and OG Kush. Skywalker (indica-dom) is an absolute knockout for pain, and after a warm, physical peak, it will set you down ready to sleep. It is in itself a cross of indicas: Blueberry, which sets the base in almost all my favorite strains; and Mazar, a true Afghani grown in the fertile northern Afghanistan. It offers a wonderful fruit flavor, and as a wax, it is smooth vaped out of my Cloud pen. The high is quiet and contemplative. I’ve used it first thing in the morning, and it has a soft lazy morning feel that is perfect for cooking weekend brunch. Mazar’s high is described as narcotic, attributed to its high CBD levels. This is where its exceptional pain relief properties derive. The other side of Skywalker OG is OG Kush. Its naming is slightly ironic because it is not actually a kush. Being a sativa dominant hybrid, if there are any kush genetics, they are minimal. This is a classic sativa in its creativity, outward social tendencies, and anti-anxiety effects. I find it perfect for dealing with stress related anxiety. It is wildly popular in LA and Orange Counties and can be found in its original form in many area dispensaries. As the story goes, and the story is varied, it is second generation to Chemdawg and made its way from its genetic origins in the Rockies to Lake Tahoe before settling in SoCal. Like its mother, it is a beautiful pale flower, smelling like Pine Sol and hitting light and citrusy. Little wonder Orange County is so crazy for it. Combining these two strains gives us the complex profile of Skywalker OG. It immediately hits with a heady, cereberal high. My thought patterns shifted and my mind relaxed from its normal rapid pace. This is the OG Kush heritage at work. As you medicate, this is followed by a floating body high. There is little down pull and the pain seems to lift from your body. I do get drowsy if I use Skywalker OG late in the evening, but otherwise it can be an efficient daytime smoke if you aren’t looking to be energetic. 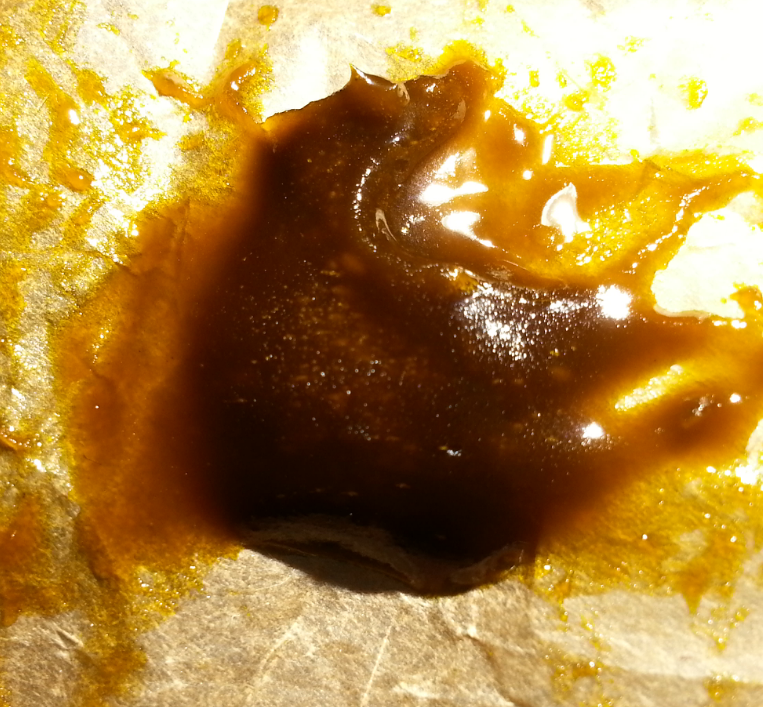 The wax I picked up from Emerald Care was lighter in color than most of the concentrates they had in and was a golden brown about the shade of dark wildflower honey. Typically, it is a good rule that the lighter the color, the less impurities and plant matter were left behind in the finished product. Emerald only carries CO2 concentrates, so I always feel comfortable using their products. I usually try to get a dryer consistency wax for my Cloud and micro-G pens to keep the mess to a minimum. 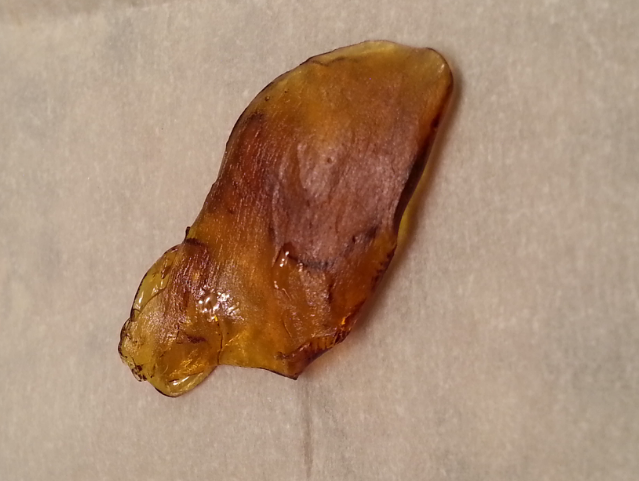 This batch of Skywalker OG was a bit wetter than I would have preferred. I immediately transferred it from the plastic screw top jar they package it in to some parchment paper when I got home, and I’m glad I did. Kept in my upstairs office, the warm weather this week softened it to apple butter like thickness. It’s not ideal to handle when loading my pen, and I probably wouldn’t donate for it again for that reason alone. Otherwise, this is a perfectly acceptable representation of this area favorite. Some days you want to be productive and engaging and reach for your favorite sativa. Other days your pain seems unmanageable or you yearn for a solid night’s sleep, leaving you smoking a dense, weighty indica. However, this past week required a bit of both. Normally I’d just split my order between the two strains, busying myself by medicating double to get all the effects, but today I decided to hit the two birds with a single stoned. I swung by Emerald Care in Santa Ana after work and donated for one of the disposable O-pen cartridges in Shishkaberry, a hybrid strain. Before I get too far in, I should tell you that Shishkaberry is an indica-dominant hybrid, a fact I did not know ahead of time, and it has had an effect on my medicating. The high starts euphoric and warm, and the taste is rich and fruity, bearing its DJ Short Blueberry heritage. You may feel clear headed and focused at first. However, DJ Short Blueberry is a very heavy indica, and once you peak, you will struggle to keep from couch locking. Although there is some anxiety control with the Afghani, the main profile of this strain for me is pain and insomnia. After a long day of computer use, my arthritis is quite severe. Shishkaberry was a perfect way to unwind after a day of work, watching some TV before bed, or listening to music with the lights off. No matter how you decide to medicate, the pain relief will be substantial and sedative. If you haven’t used the O-pen disposable cartridges, the taste begins on the exhale and is clean and true to the strain, as most oils and concentrates are. However, there is a clear glycerin follow that can be unpleasant if you aren’t expecting it. It is a tradeoff for the discretion that the O-pen allows. Emerald Care carries a selection of disposables in indica, sativa, and hybrid for just $25 each, $5 less than most dispensaries. Just remember, as I failed to do, that hybrids don’t mean an even mix of strains, and you may end up with more than you intended.